Over 8 years of sewing, my fabric needs and preferences have changed many times (have you ever looked at a piece of fabric and thought: what was I thinking?!). 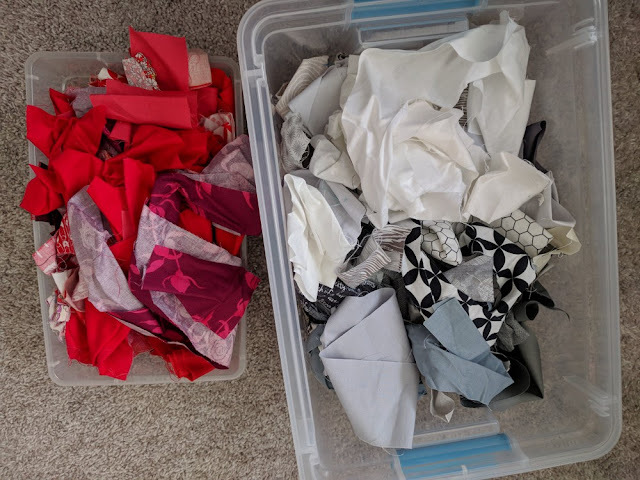 I think it's important to reevaluate your hobby periodically and make the necessary changes (which is why I have frequent fabric destashes and give a lot away to my quilt guild and students). Your hobby is important and you have to make sure it fits your current space and needs. Right now, I've come to terms with the fact that I'm making many more scrap quilts than those with yardage, so I'm paring down both my buying and fabric stash (for the record, I usually buy a half yard of something when I like it or need it). Plus, I really want to make quilts instead of holding onto fabric for years and years (this post by Jenny Kae Quilts says it all). 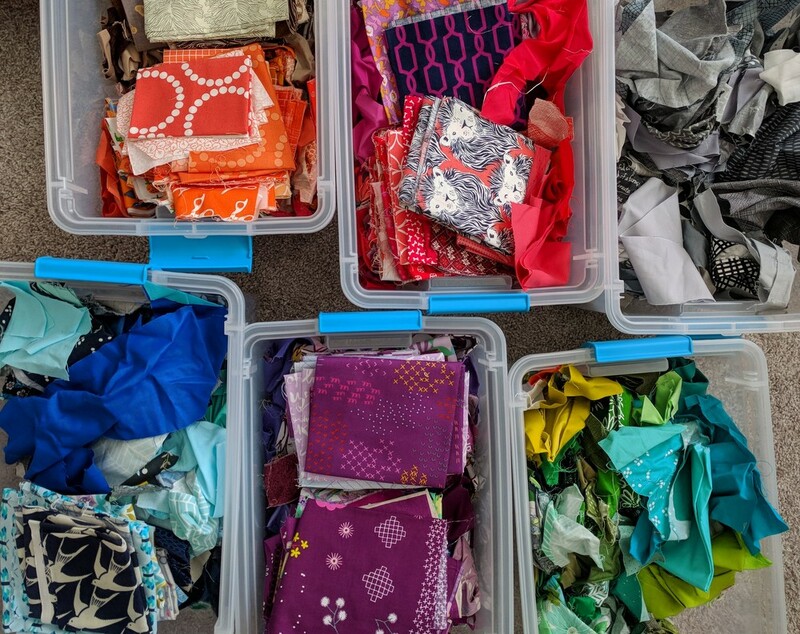 While going through my normal stash piles, I quickly noticed lots of small fabric pieces at fat quarter size or less; since they weren't stored with my scraps, I'd often forget about them. 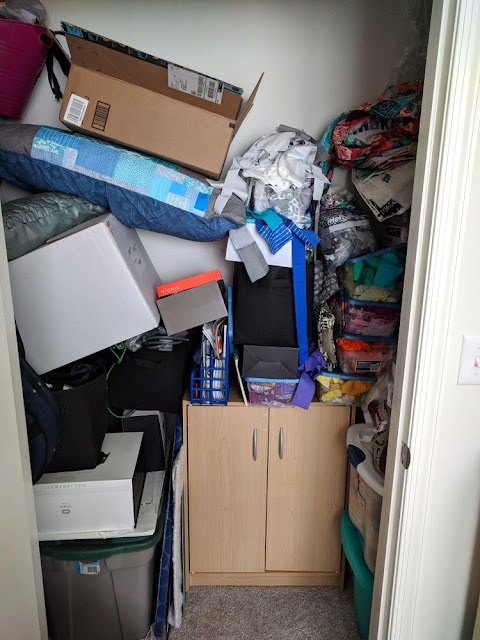 Also, the closet (shared with my husband's computer stuff) very clearly needed a complete makeover. I bought bins on sale at Target (score), which easily close and stack (my other, tiny ones, did not - see the size difference below). These are TWICE the size than the ones I was using! They fit my fat quarters of each color along with scraps. What a relief! Why did I wait so long? Before, I was also using an assortment of Ziploc bags and shoe boxes to organize scraps. Not only did it look terrible but it was confusing (besides a general organization by color). I felt overwhelmed just stepping into the closet. I didn't give it the time and attention it needed... until now. Now, I have more room to store scraps together. I combined colors together except for blue, purple, and green, which all needed their own bins (also, I have very few yellow scraps - believe it, Sarah! - so a small bin still holds those). I'm already feeling much more excited about diving into my scraps. One part of my stash that will remain in tact through change is solids, since I use them possibly 75% more often and in abundance than I used to 4 or 5 years ago. While I don't keep track of them by company or name, I'm happy with the assortment I can pull from for any project. I seem to have accumulated a lot of purples and grays from over the years, and many of these are larger pieces. Solids have become absolutely essential to my quilt-making process (here, they are on the bottom of my storage unit). Also, during this process, I went through my fabric stash 3 separate times and put together a huge pile to destash (see below). I'm also considering making up a few bundles for sale. I'll be posting these for sale on my separate Instagram account, quiltyhabit_destash, within the next month. Follow this IG account to get updates (sorry, US shipping only). So, have you gone through your fabric lately? What's changed, if anything? Your taste, needs, space, etc.? It is something I need to do...and get rid of 30 year old fabric so that something more appetizing has room to shine. Great job. Of note, I think your tastes DO change. For years, I used only thrifted fabric. I was not the best quilter so spending a lot of money for the hobby wasn't realistic. As I improved I moved to using better thread. I started to become choosier with fabric. Recently, I bought quite a few yards of Kona solids. Found I loved the quality and depth of color of the fabric. I love my scraps for free-form creations. Using the 2-1/2 squares for leaders and enders. I get less stressed if I have scraps organized. Those bins are the best! I like how you reorganized your stash in the closet. I am sure you will use it more now. I have been doing this a bit at a time for all the reasons mentioned! My taste has definitely changed but then we have so many more fabric options now than when I started quilting 39 years ago. My needs are different, I tend to make smaller projects these days and having downsized houses from 3000+ sq feet to 1800 my space is definitely smaller so being tidy is required :-). Thanks for sharing it is spurred me to work on my studio space today! I definitely will be going through my stash as I work to downsize. I think it is likely I will end up with solid yardage only, but maybe a few blender prints will find their way to go with me, too. It will be an interesting process figuring how how much I can travel with. The new bins look very inviting and I love it when bins stack and nest neatly. i love to be organized and moving last year helped. I still want to cut down some scraps to usable sizes instead of the mish mash. I was trying to make pillows with some of the scraps - using it as filling - but not sure the shelters wanted them as I thought they might. It really is nice when you can see where things are and find them ready to be used. 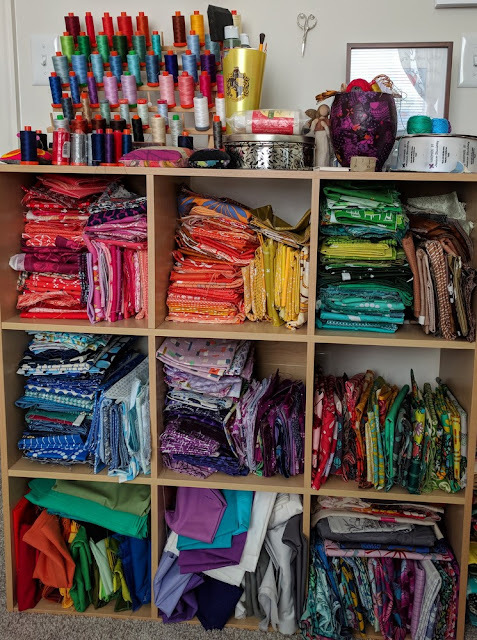 I go through my stash every so often (a few times a year) , but I think I hold on to too much and i'm starting to destash more often ususally giving the fabric to my guild for donationa quilts. This is a great post. Like you, I store mine in the plastic bins. They are organized by colors - the eight on the color wheel, brown plus neutrals. I throw the solids in with the prints. Although the neutral pile is growing, so I may have to divide to black, white and grey into their own box. Pink and Turquoise boxes have been added just last year. I may have to do a light blue and light green. We'll see. Using the same style of box helps with the organized look and it is easier to stack. I still have fabric from when I started quilting in the mid 1980's - I guess they are "vintage" fabrics now. I like keeping those old fabrics as a way of blending the past with the new. I have to say that I am glad I never downsized my fabric collection so I can say "oh this fabric was used on my friend's baby quilt" and those memories are important to me - probably not any one else but I like the reminder of my old quilts. Also, I like visiting mom & pop fabric stores when I travel. I ask them if they source any local designers to the area and buy a quarter of a yard or some fat bundles as a souvenir. I have learned that different areas stock different colors and patterns according to the aesthetic taste of the quilters in the town. Really fun because I might not have considered some of the patterns that were popular in the town but really like how they blended in my other fabrics. Thank you! I’m in the middle of a huge destash/organization project for my sewing room. I currently have fabric all over my living room and dining room. I have realized that I have more fabric than I can possibly sew up in my life time and I’m only 67! Thank you for the encouragement, it couldn’t have come at a better time. I also read the article by your friend. I will be making a giant poster that says “Leave Quilts, Not Fabric”. That article made my heart so sad, and gave me encouragement to finish my destash and MAKE QUILTS! Thank you so much for this post. My last big scrap decision was culling through everything and giving the majority of it away. I needed to stop looking at the same fabrics to get inspired. This strategy worked! Wonderful organization. I attempted this myself a few months ago. Well, it's some better now. My stash storage looks similar to yours but it's all in the closet of my sewing room. I use a cubby unit with my print fat quarters on the upper shelves and my solids and yardage on the lower ones. I wrap my yardage on magazine cards which really keeps things neat and tidy. I also use the clear plastic shoe boxes for all of my scraps, a bin for each color family. Those are stacked on the wire shelving that's in the closet. I'm trying really hard to use fabric that I already own instead of buying more. I have too much and it actually causes me more anxiety when trying to start a new project. I can't decide on fabrics to use. I guess too much of a good thing isn't necessarily good for me! Having read all this, I now know what I'm going to do today. There's no "before" picture; it's too horrendous, but maybe an "after" on IG later this week. Great post and reminder to go through the stash. 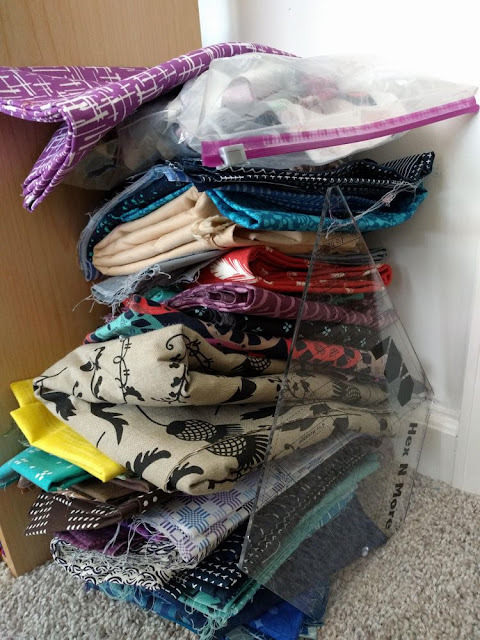 I have done two small purges so far this year which have helped a lot, but did just get a bunch of new fabric that has no place to fit in the sewing room right now. I just did a urge myself of fabrics years old that I was not getting to. I gave it all away.